As always, all units are available on the Google Code. When compiled with D2007 or newer, unit FileCtrl is not included. Call UniqueString before calling CreateProcessW. [Tommi Prami] Added types missing in Delphi 7. Added function DSiDisableStandby that will try to disable standby and hibernate on Windows XP SP 2 and newer. Define TStartupInfoW in Delphi 7 and earlier. behaviour if the rule with the same name already exists. Bug fix in DSiAddApplicationToFirewallExceptionListAdvanced: setting rule.ServiceName to '' caused fwPolicy2.Rules.Add(rule) to raise exception. Contains TForm descendant that implements simple logging to TListBox and some other useful extensions. First public release. Simple synchronous HTTP GET and POST using ICS and OmniThreadLibrary. First public release. 32-bit version of TGpHugeFileStream.Seek returns EGpHugeFileStream exception with help context hcHFInvalidSeekMode if seek offset doesn't fit in 32 bits. Added method RemoveObject and enumerator WalkKV to the TStrings helper. Fixed TGp[Integer|Int64]List sorting (broken since 1.44 release). [Jens] Capacity was not set to the ideal value in TGp[Integer|Int64]List.Append. [Istvan] Reintroduced Insert methods for Counted Integer and Int64 lists that accept a count parameter. Added overloaded version of EnsureObject. 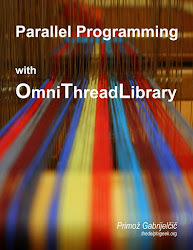 Dynamically allocated, O(1) enqueue and dequeue, threadsafe, microlocking queue. Code taken from the OmniThreadLibrary project. First public release. 64-bit random generator with very long period. FORTRAN program posted by David LaSalle of Florida State University. Adapted for Delphi by Anton Zhuchkov in February, 2002. Units ExtCtrls and Forms are referenced only on pre-2007 Delphis (for compatibility). ReadTag functions always uses strings with explicit "wideness". String hash, table and dictionary. Supports Ansi and Unicode strings. First public release. Asgn overload taking Ansi/Wide strings. Added IFF overload with AnsiString parameters (Unicode Delphi only). Unicode files recognize /000A/000D/, /000D/, and /000A/ line delimiters. Unicode files respect ldCR, ldLF, ldCRLF, and ldLFCR AcceptedDelimiter values. Reversed Unicode streams were improperly read from. how about a demo showing the use of all GP units? Thanks for this awesome work.